Laying low, Sophie moves in with her grandmother, Bubbles. That way, she can keep Bubbles and her sweater-wearing pug company and nurse her broken heart. But when Sophie gets a part-time job at the old-fashioned neighborhood bakery, she finds herself up to her elbows in dough and reluctantly giving a wedding cake customer advice on everything from gift bags to guest accommodations. Before she knows it, she’s an online wedding planner. It’s not mousse and macarons, but it pays the bills. But with the arrival of unexpected personal and professional twists, Sophie wonders if she’s really moving forward—or starting over from scratch..
Stacey Ballis has great characters. I loved her last novel and was really looking forward to this one. 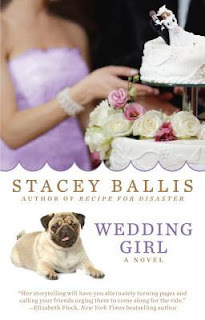 While Recipe for Disaster is still my favourite I really enjoyed Wedding Girl also. I loved Sophie’s relationship with her family, both with her grandmother Bubbles and her parents. She seemed to have had a somewhat unconventional upbringing which led to their closeness and their openness with each other. I love when there are multi-generational bonds in a story that come together so well and so naturally. Again, Ballis wrote a novel with both a love story and a career. We were given a thorough look at the running of a bakery and the makings of all the goodies as well as the intricacies of pastry making. Sophie was also a wedding guru blogger which gave insight into another business of sorts and I adored the woman who set her up with the second business (though somewhere along the line she sort of disappeared from the story line which was disappointing because I really liked her input) and thought she added to the novel. Sophie had a couple of other best girls though and they played their part well, you could feel the warmth between them from the start. You also cannot forget the dogs- they were definite personalities in this novel. Though the love story was a bit obvious (at least you hoped it was going to be the obvious choice) for me that's just a small part of a Stacey Ballis novel. Most of what I take away from them is the depth of the exploration of the careers of her main characters and the various relationships developed throughout the plot and there’s plenty of funny bits to keep up with the fast-paced plot. Thank you to Berkely Publishing Group for our review copy. All opinions are our own.